You’ve been dating for two years and his cell phone is oftentimes off. You met him online, but something doesn’t feel right. You married him ten years ago and have this funny feeling inside. You believe in “happily ever after” but sleepless nights are wearing you down. Too much time passes before your calls are returned. His meetings are running late into the night. The distance between you is growing. You are feeling fearful, anxious, and angry. Sad to say, even marriages “made in heaven” are sometimes complicated by infidelity. Right now you may be wondering whether you should stay in your relationship or marriage and be forgiving or leave. This book will help you decide to stay with integrity or leave with dignity. We all know someone who has a cheating spouse, but gossip does not make an epidemic. Through this book you will come to see from actual case file stories and interviews with nationally respected authorities – powerful facts about marriage and thoughtfully designed action plans. Save your marriage through forgiveness or end it with integrity. 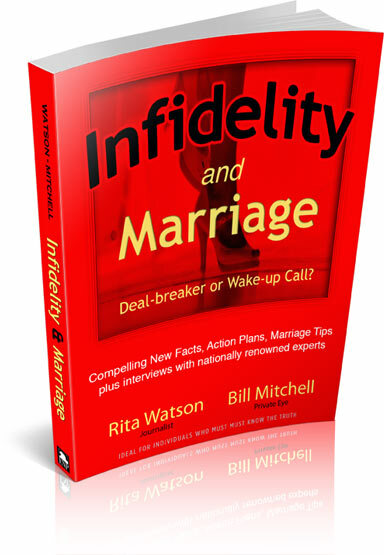 But if you are the victim of infidelity – it can be emotionally devastating. This is the time to learn what’s real and what’s not. With each passing day you maybe learning how to cope, but is that really what you want? Stop the sadness. End the turmoil. Learn the truth. Take control. And then decide.